FORTY THREE DAYS! Yes that is me hollering. Not enough hours in the day but the time will be found. After many fits and starts the flower girl dress and ring bearer rompers are pleated. It occurred to me while I was pleating the flower girl dress for the SECOND time, that I should share it with you. Often times it is a challenge to choose fabric for a flower girl that matches the bridal party or the bride. I got around that by ordering fabric from the wedding dress designer. Fabric came off the same bolt as the bride's gown, so we know it matches. No, this is not the most economical choice but it a choice. Another advantage is, this is the most gorgeous piece of silk dupioni I have ever seen. The character of silk dupioni is the "slubs" that occur in the weaving of the fabric. Out of four yards of fabric I could count on one hand the number of slubs woven into the fabric. It is a delightful weight and as I said, the clearest dupioni ever. As I mentioned, I had to pleat the dress front twice, the first time was a hot mess!! So many creases and catches in the pleating it wasn't funny. It took me 30 minutes to get the needles out of the fabric and then to get the threads out of the 36 rows of pleating. I held my breath as I pressed it flat. Silk does not like to be unstitched and it really hates being unpleated. The smocking fairies were with me, no marks or holes. 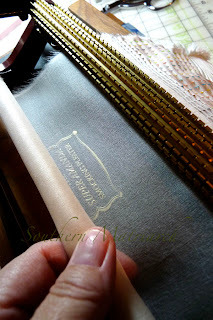 So I will share in a few pictures the process of pleating two layers of silk. I underlined the dupioni with silk organza to give the pleats more body. 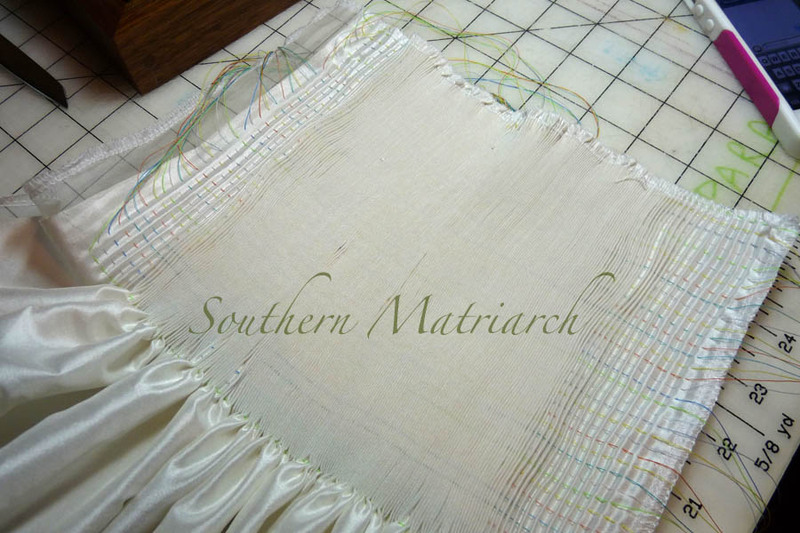 Silk can pleat into flattened out sharp little pleats that can be tough to smock. Underlining it with the organza was just the ticket. This can also be done with fusing German interfacing to the dupioni as well. 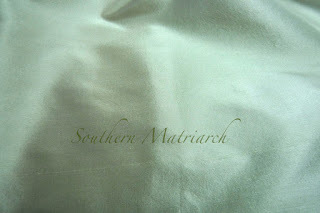 Since I love silk organza so much, that is what I chose to use. Gail Doane says that pleating two layers of silk together is a two person job and one person can't be a husband! Well I was pleating this at night so my usual co-pilots weren't available and I couldn't even utilize the forbidden husband, he was out of town. I had to go it alone. 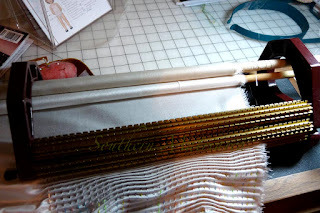 I almost never use a rod to roll my fabric on for pleating. In this case it was not only helpful but required to control the two fabrics. I DID NOT baste the fabrics together. Another tip I learned from Gail D. She is better at physics than I am. By basting the two fabrics together, you are asking them to behave as one as it goes through the rollers of the pleaters. An impossibility. No matter how hard you try to prevent it, the fabrics are going to travel through the rods at different "speeds." So I rolled them on two very long dowels, 48" The length allowed both ends to rest against the end pieces of the pleater. My pleater is in a case, so it sits up off the table by about 4". Because of the height difference, you don't see it in the picture but the far left end of the dowels are resting on a wireless speaker to keep the dowels at the same level all the way across. This helps keep the fabric a wee bit tamer and easier to control. I rolled the silk organza first, then rolled the dupioni second, placing it on top. I placed the dupioni on top to be able to see what what happening with the fabric that was going to show. If I got a crinkle in the organza it would not be as crucial. 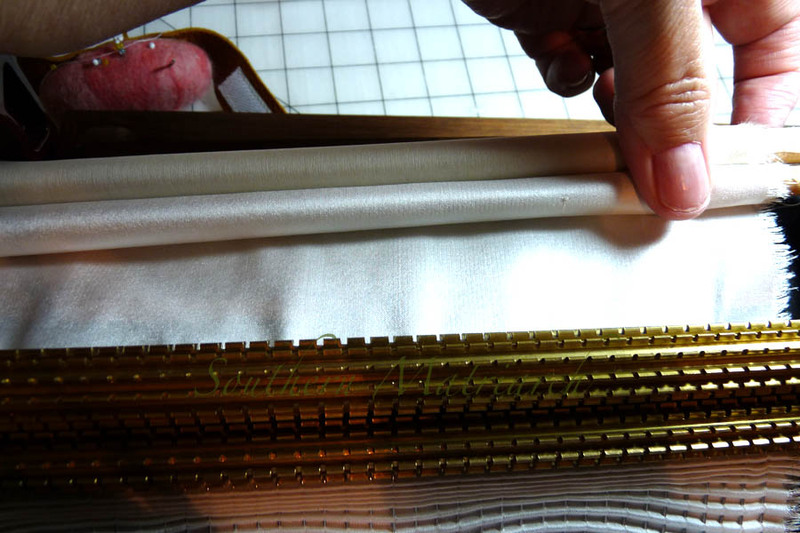 You want the fabric smooth and taught on those rods, as I pleated along I would re-tighten the fabrics on the rolls to keep it all smooth. Another tip is also that the two fabrics will NOT end up at the same place through the pleater. If you cut two lengths 24" wide and feed them through the pleater, one is going to be longer. Again that physics thing. Because I am basically a lazy person instead of trying to guesstimate which one would come out longer/shorter or what ever I didn't cut the organza. My pattern called for a piece of dupioni 42" wide, I just used the whole width of 58" of organza. That way I knew without a doubt that my dupioni would be underlined all the way across without running the risk of the organza falling short by 3-4 inches. When I got to the point that the dupioni disappeared into the pleater I very methodically eyeballed the remaining organza and whacked it off. If you have ever worked with silk you know it ravels like crazy. To insure you still have enough silk to sew into a dress you have to finish the edges. Due to the pleating challenges already presented I didn't want to serge the edges beforehand. The resulting thicker edge along the top would further effect my pleating. Instead I left the pleating threads really long so that I could flatten it out after pleating and then serge all sides. When serging, be careful not to cut your gathering threads. Voila! My gathering threads have been drawn back up and my dress front is ready to go. Not a crease or crinkle to be seen. I am off to match threads and start smocking. Wow, I would have been terrified!! It looks beautiful! Wow! It's going to be gorgeous! I bought my granddaughter's dress as flower girl for my younger daughter's wedding last summer. She was only 20 months old, but still, she just wouldn't behave - until we took off the dress. Apparently, she just didn't like it. Once all the pictures were over, we took off the dress and she was a delight. Live and learn, I guess. I hope your daughter's wedding is a wonderful success. I'm positive the flower girl's dress will be awesome! I envy you in your pleating success! Great photos and text. I especially like the one showing the two rods in the pleater. It was very helpful. The result is beautiful! Can't wait to see the finished dress. Thank you, Martha. Such patience! This will no doubt be spectacular. 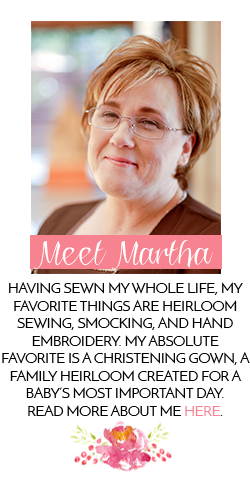 You did a great job explaining everything, Martha. Beautiful -- and it is not even finished! So happy those smocking fairies finally paid a visit and hung around long enough to complete the job! What dedication! I love this fabric but the one time I smocked with it... I pleated it 3 different times! It was so frustrating, but the end result was a beautiful flower girl dress for my daughter (the banner on my blog). She was 5 and is now 19 so perhaps I should try using it again! Hi Martha. I held my breath while reading your pleating story. You are so very talented, courageous & slightly crazy to even attempt pleating such beautiful fabrics. 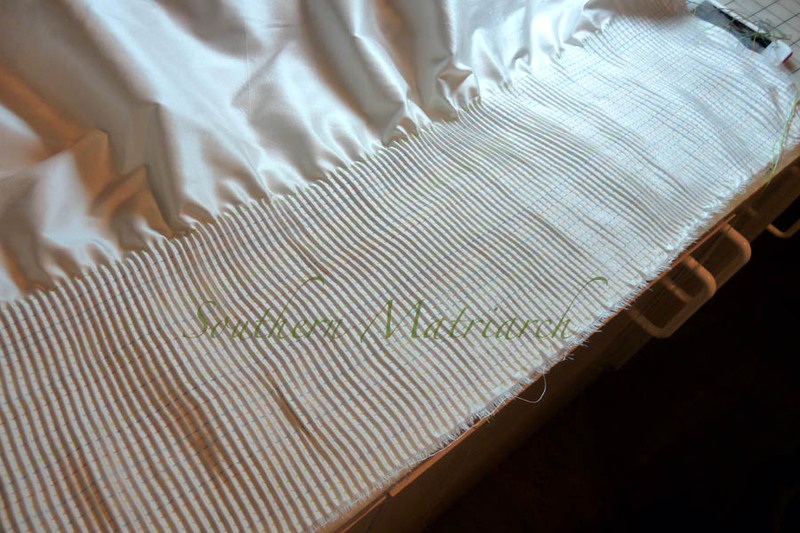 My heart almost stopped when you said you serged all four sides once the pleating was done. How on earth did you ever serge the top edge with the top row of pleating threads so close to the edge? I'm sure I would have serged that top row & ruined the entire piece. Bravo! Hi Martha, May I ask a question? Was the organza cut the same length as the dress front or just as long as the smocking will be? Thanks for this great tutorial. Capi, glad to answer your question. The entire garment is underlined with silk organza, so yes the organza was cut the same length as the dress front and pleated together. The info is quite useful. This helps keep the fabric a wee bit tamer and easier to control. great job ! Flower girls bring smiles to your wedding party and guests. 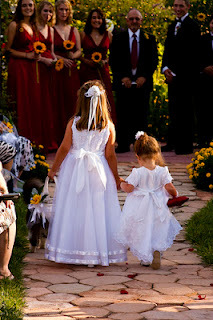 The flower girl, usually an adorable little lady aged three to eight, proceeds down the aisle before the bride, carrying flowers or scattering rose petals along the bridal path. I agree sometimes flower girl dresses can only be worn for one occasion.